New York : Putnam, c2003. It was a decent book. Not stupendous, nothing that I'm going to force my friends to read. I don't generally read biographies, so that might have accounted for my lackluster response to this, since Scott Berg seems relatively experienced at writing biographies. Read about half the book, wasn't very interesting and not enough about Kate. Didn't want the dirt, just a little more about what makes her tick. Wow! I know the author is honored to have been able to become a part of Katharine Hepburn's life. It's hard to get to know such a private person. But Kate allowed Mr. Berg to do just that. His writing is wonderful. Personal memoir of a friendship with the actress Katharine Hepburn. I was a big fan of Kate, as an actress. While the author respected her, I'm not sure I'd have felt the same if I knew her. Ah...but the gal did know how to act! 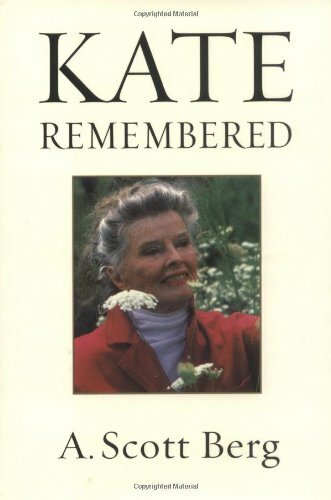 EXCELLENT memoir of the author's time spent getting to know the fabulous Katherine Hepburn. A love story of sorts. This biography is a little unusual, as it is really A. Scott Berg's story about a woman he knew, admired, and even loved -- Katherine Hepburn. This particular angle on biography was new to me and it seemed to work very well. Berg makes no pretense about impartiality, but he's also a professional biographer, so he avoids fulsome praise or prurient detail to hold the reader's interest. Instead, we get to see a very interesting woman through the eyes of a person well situated to watch her.